...but she can't get it. Come Fall 2015, I'll be teaching, for our Popular Lit class, a class in Dystopian/Utopian literature which I proposed a few weeks ago. Can I just say, Oh BOY? Luckily the other classes I'm teaching I have already taught, and I know the books I'll use for those; and that I already have some idea of the texts I want to use. Here at the start of the semester, when I have no time to read or write, I am suddenly writing and reading furiously: working on several short stories and all three novels again. It's blissful. And reading! So much to read. Not just the many texts I am reading for classes -- though I am reading a great deal for class -- but also plenty for fun. I have discovered Scribd, which if you haven't yet, turns out to be (so far) a boon to those of us who read voraciously, but live in towns with severely inadequate libraries. For a relatively small amount a month (about the same amount Netflix charges) you can borrow an unlimited number of ebooks. Granted, they don't have every title. But they have a good selection. I may have mentioned Miss Read before. She's a comfort read. 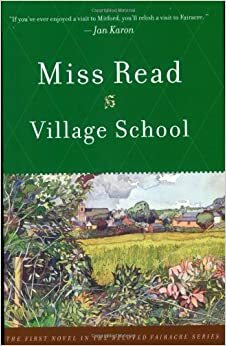 My favorites are the Fairacre novels, which chronicle life in a small (and fictional) English village, told from the point of view of the village school teacher. Miss Read (whose name is actually Dora Saint) wrote another series about Thrush Village, which I don't like as much. These novels were written between 1955 and 1995. On the edge of being too conservative (British conservative) to suit my taste, but on the other hand, extremely readable and charming. As long-time readers of the blog know, Eleanor Arnason is almost definitely my favorite SF writer on the planet. 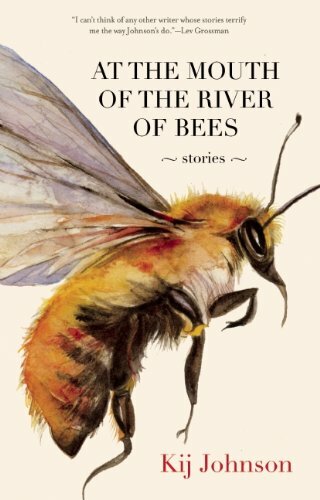 This is her new book, and it's wonderful. Having said they are indescribable, I will attempt to describe them: these are stories about realistic (not mythic) humans who encounter elves and trolls. What happens next? If you were a hunter and your prey suddenly spoke to you, how would you react? Especially if you were a cranky old hunter who had been living alone on your farm for quite some years. That's the kind of subject Arnason tackles. The stories that result are wonderful. Take all the people ever, throughout history, who have ever wanted to build Plato's Republic. Put them on an island, back at the start of time. Add in ten thousand ten years olds. Now press go. 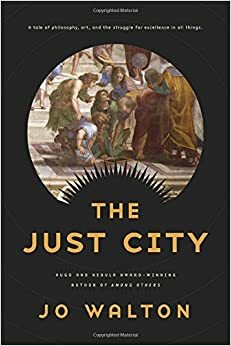 Can we build the Just City? That's the premise to Walton's The Just City. This book (and its two sequels) will be of most interest to those of us, like me, who grew up reading Mary Renault's books on Plato, and thus fell happily, when we hit the university, into philosophy classes that let us study Plato and classics classes that let us study Greek and Latin so that we might read Plato and Homer in the original. But even if you didn't, you might like this book. You don't need to be a Classic geek like me to get what's going on here, is what I am saying! This one's a collection of SF short stories. Johnson writes a really mixed collection -- by which I mean, her stories are mostly all different from one another. I can see some common strains, in that she writes about animals frequently. One of my favorites by here is "The Cat That Walked A Thousand Miles," which isn't really science fiction at all. It's about -- seriously -- a cat that walks a thousand miles, trying to find a new cat family, after the Toyko earthquake. Another of my favorites by her, possibly one of my favorite stories ever, is "The Evolution of Trickster Stories Among the Dogs of North Park After The Change," about what happens to the world when dogs learn to talk. This is a strong collection. Well worth the read. This is a sequel to McDonald's wonderful Annie Wu Saves The Future, which I reviewed formerly on this blog. 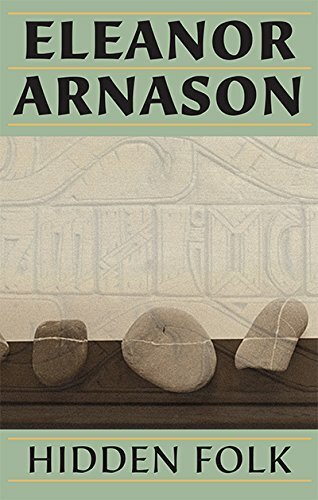 McDonald, like Arnason, is one of my favorite writers, and I love this series. It's aimed at middle-grade readers, so if you're one of those people who doesn't like reading YA Lit, be forewarned. Me, I love the genre. This one is even better than Annie Wu, which was wonderful. I look forward to more from McDonald in this series. Since my kid has returned to high school, our mornings have been fraught, y'all. First, we have to wake up at actual freaking dawn. Only Dr. Skull is a morning person. He wakes at four, usually. Sometimes three. This is handy, since his new job is subbing in the local public school system, and this means he gets first crack at whatever work is available. He is awake when the new jobs come up on the system, in other words, and can take his pick. I wake up, cursing, at six, stagger out into the kitchen, still cursing and dodging cats, to make the kid's lunch. (The cats demand their share of the tuna from the tuna fish sandwich. They get some, too.) When the lunch is made, and I am somewhat awake, I wake the kid. Me: "Look at the clock." The Kid: "Why school. WHY." Me: "What do you want for breakfast?" The Kid: "I want to die." I make her grits and eggs. She emerges as they are finishing, glumly, with her iPad, and eats while I make coffee for myself. Dr. Skull comes, chipper, from his shower, to announce he has taken a job teaching band at Darby. Me: "What! You hate band! You said you'd never do band again!" Dr. Skull: "That's all that was open, though." The Kid: "Brush my hair." Me: (getting the brush): "You could learn to brush your own hair." The Kid: "I always mess it up." Me: "What are you going to do when you get to college? Who will brush your hair then?" The Kid: "Once I graduate high school, I am going to shave my head." Dr. Skull: "Where's the boiled eggs?" Me: "Did you want me to boil them?" Dr. Skull "-- -- "
Me: "You didn't say you want me to boil them." Me: "You could brush your own hair." Dr. Skull: "I'll take cheese sticks." Me: (to the kid): "Why do you always have feathers in your hair? Are you consorting with angels?" The Kid: (To Dr. Skull): "We're gonna be late." Dr. Skull: "I need my iPod." He wanders off. The Kid gathers all her many items -- backpack, purse, Trapper-Keeper -- and waits impatiently by the door. I refill my coffee and collapse in my big chair with my laptop. Me: (as they leave): Goodbye! Have a nice day! I'll be lounging about here! Drinking coffee! Dr. Skull: "Bye, sweetie! I love you!" So, no excuses here. Just bragging. My kid went back to public school, as y'all know. This past October she took the PSAT. Today we got a letter from the school, saying that due to her high scores on the PSAT, they're recommending we put her in all AP classes next year. We've started the new semester -- Spring 2015, huzzah! -- and I am teaching a lovely schedule. Oh, it's not perfect. (Nothing is perfect: it has lumps in it.) But it's very nice. I've got four preps -- that's one of the lumpy bits. Another is that my classes start at 8:00. On the other hand! All my classes are on Tues-Thursday. And! I am teaching English Grammar, which, as long time readers of the blog might remember, is my very favorite class to teach. Also: one section of Comp II, one section of Global Lit, and one of Fiction Workshop, all spaced nicely apart, so that I can teach at a leisurely pace, and all in my building -- the one my office is in, I mean -- so that I don't have to rush about the campus, and use foreign classrooms. Anyway! The first week has gone well. And may I just add this: despite what you get told, every year now since I started teaching, the students get smarter, they are better educated, and they are much nicer besides. Someone is doing something right. Issue # 25 of Crossed Genres is live. This is the Indoctrinate issue, featuring wildly varying stories (as usual!). As a side note, this is the very first ever issue of CG magazine to feature all male writers. First up, a story from Julian Mortimer Smith, "Cabaret Obscuro," a dark tale about a dark cabaret and the aliens who inhabit it. "Distant Gates of Eden Gleam," by Brian Trent, might be my favorite from this issue, for purely personal reasons. No spoilers. Just go read. And for Narnia fans, you're gonna love "The Lion God" by Benjamin Blattberg. Even if you're not a Narnia fan, you'll love it. I did. Interview with Benjamin here. By the way, we are open to submissions for new stories. We pay professional rates, and are a SFWA qualifying market. We are especially looking for stories from and about LGBTQ writers/characters, writers & characters of color, women writers/ characters, characters with disabilities, and characters and writers who aren't from North America. So I'm teaching my kid how to change the light bulb in the overhead light in her room and we're still in our pajamas. The Kid: Holy smoke (or words to THAT EFFECT). Why don't girl pajamas have pockets? Me: Well, we're girls. We're not going to be DOING anything. We just lounge about and eat bon-bons. Me: Here, hold these so I don't lose them. This has been a grim year for me, with my brother dying (that was the worst) and other bad news coming at me in all directions. My retrospective, as I've browsed through 2014, has shown me that bad news outweighed the good at about three to one. BUT: In my retrospective, I'ma give you Only The Good News Edition. One Good Thing From Each Month. That's it, folks! A few months, I could have listed more than one good thing -- but most months, not so much. What a loser year. Here's hoping 2015 will get its act together.